This is the same stamp and polish over China Glaze Light As Air. Pretty also, but I think I really prefer the look of the green/blue combination. Bundle Monster has such great full nail patterns, they're just so small... Maybe Konad should do more new designs! I also love the whole-nail-patterns, but I agree with you, those from bundlemonster are so small, I don't know what they are thinking how big nails are ... those from konad are better, but on my thumb even those are too small. Last month I just bought the 21-piece set from BundleMonster. Am really excited to try them out. And just recently, I tried my first Konadicure - a funky purple zebra manicure! 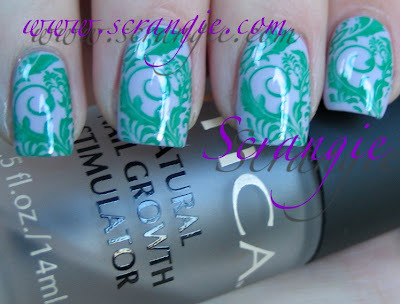 I'm a newbie, so I thought I'd ask (for Scrangie or anyone reading this): Do you have a favourite quick-drying top coat to use for Konad stamping designs? 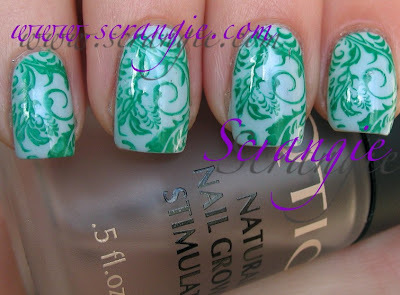 I use Seche Vite Dry Fast Top Coat, but it tends to create streaks in the design. Is it because I haven't waited long enough for the special polish to dry? I've heard from some people that you have to wait a while. But maybe it's just my top coat. This makes me want to go do my nails. Love, love it. Very nice nails! The best are with Hard Candy. it's a sweet color! where would I get this pattern? 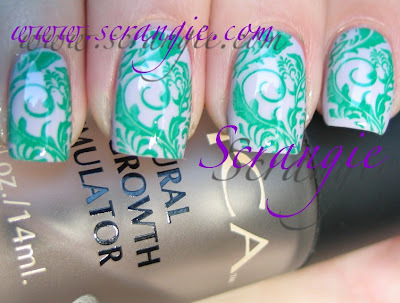 I have never done nail stamping before but after seeing this i'd love to try it! my jaw literally dropped when i saw this mani. oh my GOD its beautiful!! These are so gorgeous! 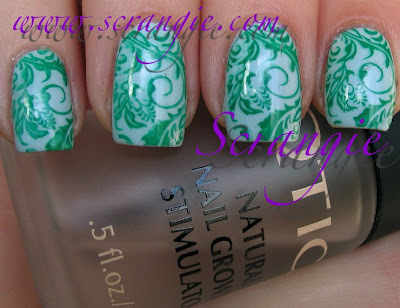 I love when stamp patterns and color combinations make nails look like porcelain. Both of these do. Stunning! The design and colours are gorgeous! Beautiful job! This looks so nice! What a fun design.